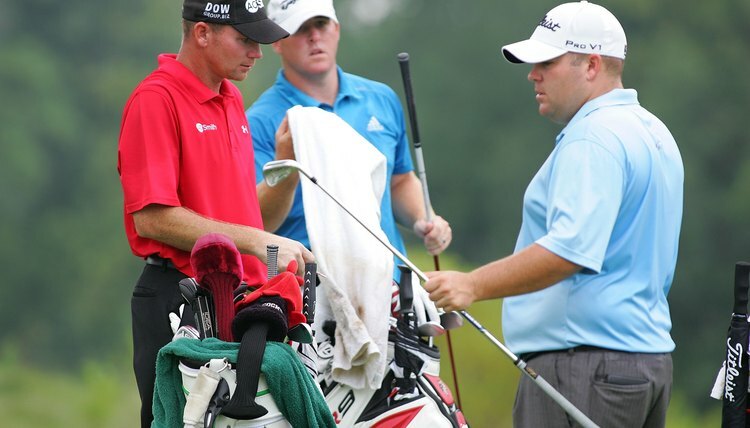 Most PGA Tour pros use stiff or x-stiff shafts. Depending on what type of swing you possess, stiff-shaft irons might help you control your shots better, achieve optimal results from a swing with a fast tempo and aid your short game. The most flexible shaft is designated as "ladies" and the least flexible shaft is called "x-stiff." As Golf.com states, "Choosing the right shaft is crucial to lowering your scores as well as giving you the feel and control you desire." Stiff shafts are recommended for players who generate high club head speed. If your swing speed is 90 mph or higher, a stiff shaft or an x-stiff shaft should be a good fit. As Scott Hennessey, president of shaft manufacturer True Temper, told Golf.com, if your shafts are too flexible, "you'll spray the ball all over the place." The United States Golf Teachers Federation states that a player with a fast swing tempo and/or a short backswing will play better with stiff shafts. Senior pros Tom Watson and Lanny Wadkins are examples of players with such swings. Stiff shafts will allow you to better control your irons without sacrificing much distance. As Golf.com notes, almost all wedges have stiff shafts. The reason is simple: When it comes to your short irons, control is more important than distance. Some manufacturers are increasing stiffness in short irons for more control and increasing softness in long irons for greater distance. If you don't generate a high amount of club head speed, long and middle irons with stiff shafts are likely to hurt your game. You will have trouble squaring the club face at the moment of impact and will tend to push and slice shots. In addition, the flex of the shaft won't be whippy enough to increase your club head speed. That may cost you distance. It is also important to remember that there is no uniform industry standard regarding shafts, so one manufacturer's stiff shaft might differ from a stiff shaft of another. Finding the right stiff shaft for your irons often is an "investigative" process, according to the USGTF.